Forward Oklahoma City was established to create quality jobs, increase capital investment, retain existing business and improve per capita income. Through four five-year cycles, this dynamic economic development effort has produced results far exceeding expectations, repositioning Oklahoma City as one of the top economic development site locations in the country. The first of the five-year economic development programs was created to expand Oklahoma City's economy and increase employment, investment and income. Forward Oklahoma City II built on the success of Forward Oklahoma City I. Accomplishments of FOKC II included leading the effort to pass Right-to-Work and MAPS for Kids; attracting Quad/ Graphics, the second largest provider of print, digital and related services in North America; and siting Dell, Inc., on the Oklahoma River. The Forward Oklahoma City III initiative centered on four key components - position, place, people and projects - all of which focused on a vibrant business environment, positively raising Greater Oklahoma City's national and international image and positioning the region for growing, expanding and attracting high-quality jobs. This cycle also included the Big League City and MAPS3 campaigns. Forward Oklahoma City IV recognized that national and global economic development has changed and addressed four major areas of focus accordingly. The intent of the program was to grow Oklahoma City companies and industries, maximize Oklahoma City’s competitive advantage, market to attract new companies and investment and seize Oklahoma City’s opportunities. Diversifying the economy with emphasis on cluster development and entrepreneurship. Growing a quality workforce by advocating for better results in public education and enhancing and growing talent. Improving the area’s quality of life. Growing corporate presence through recruitment, retention and expansion. Strengthening the business climate by creating a climate for growth companies, expanding coalition development and grassroots activities and ensuring Oklahoma’s future business climate. Advocating for regional transportation development. See Forward OKC V's lead investors. 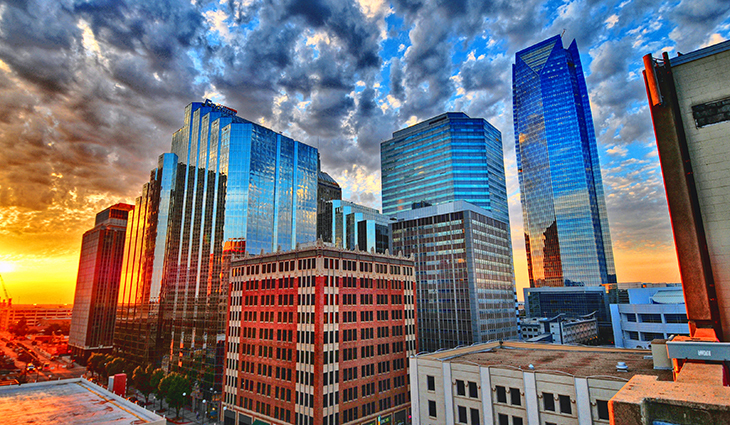 The Forward Oklahoma City programs have had a major impact on Greater Oklahoma City's economic growth and prosperity. Woven throughout these campaigns is a focus on advocacy in areas that are critical to helping advance the city's momentum. For more information, or to get involved in Forward Oklahoma City, please contact Carlos Lopez at 405-297-8937.